Pirelli Car Tyre Markings Decoded! Here’s how Pirelli tyre markings can help you to choose the best tyre for your car. Car tyre markings are simple when you see something like 195/60 R 16, as this is the standard way of representing the size of a tyre. However, every once in a while there is a marking on some tyre that is almost like a puzzle and inconceivable the first time you see it. The most common source of confusion are the speed ratings, which make the whole marking look like this — 195/60 R 16 89H. But, thanks to www.tyremarket.com , you can now easily find the speed rating implications to simplify your search. The speed ratings are not the only extra markings that find their home on a tyre, as with the growing race for perfection, automakers are motivating tyre manufacturers to make tailor-made tyres that specifically fit their cars. And, one such tyre maker is Pirelli, which has a long list of tyres purposely designed for a particular type of car brand. The well-known Italian tyre giant has put its time and effort in collaborating with top car manufacturers across the globe to develop tyres for a particular car. But, what’s the benefit of doing so? Well, the need starts with the drivers themselves. Every car manufacturer is focusing on developing a car around the driver; so that it can serve them better and Pirelli has designed tyres specialized to these cars. The second part of the development includes the construction of the car and it heavily depends on weight distribution. For instance, a car with a front engine will have a different weight distribution than a car with a rear mounted or mid-mounted engine. Next up is the compatibility with electronic systems such as ABS, ESP, EBD, traction control and so on. Only a tyre that has been thoroughly tested can produce optimum results for the car it is made to serve. It doesn’t just stop here, the marked Pirelli tyres also consider the factors initiated by the latest drive-train mechanisms such as the all-wheel drive system, the hybrid drive-train and even driver aids such as adaptive cruise control or lane-keep assist. The Pirelli tyres are homologated for more than six months to achieve that perfect tune. Moreover, the development phases of these tyres include co-designing with car manufacturers and meticulous prototype development that ranged from two to three years. 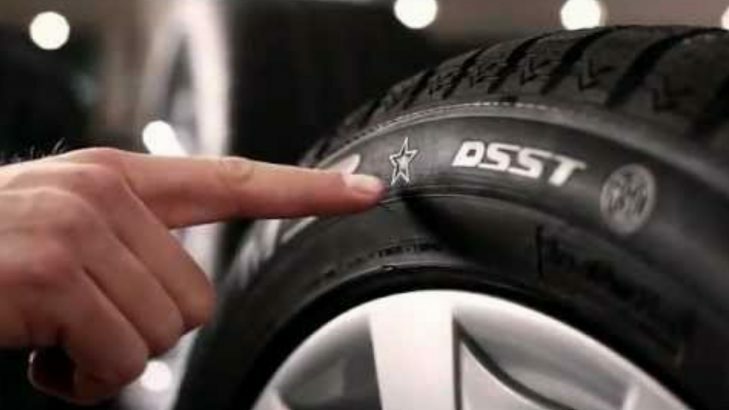 Since there is a long list of marked tyres here is how to identify the one for a specific car. For BMW cars, this particular marking (✰) is the one to look for. The simple star (✰) is easy to miss since it is quite small compared to the rest of the size marking. Moreover, the marking is a standalone mark away from the size marking. The tyre with this marking is specifically made for BMW, in collaboration with the manufacturer itself. If you equip a BMW car with (✰) marked tyres, it will gain optimal performance as opposed to the one that doesn’t have it. The tyre in a BMW car is optimised for features that make the tyre resistant to aquaplaning and lends it additional grip on slippery roads. One such example is the Pirelli Cinturato P7 RF tubeless 94W car tyre, which was specifically developed for the BMW 3 Series. Therefore, the performance Pirelli Cinturato P7 (✰) will be better as compared to the same tyre without the dedicated (✰) marking. Similarly, one can repeat the aforementioned drill for a specific tyre for their cars. The following table is a detailed breakdown of the various markings. When locating them on a tyre, look for these symbols on a Pirelli tyre.